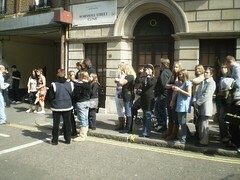 No, this wasn’t a queue for the Marshall Street Clinic in Soho. Wash your minds out with soap. There’s a reality TV show (well, ‘reality’ might be stretching it a little) called WAGs boutique being filmed over the road where a group of young women who have some relationship to a sportsman get to run their own fashion business with a shop off Carnaby St. For some reason hundreds of other (presumably less fortunate) young women (and a few guys) were lined up over the street and being admitted in small groups. I assume they are going to have the thrill of meeting some of these superstars and end up on ITV2. I saw Tamara Beckwith in one of the shops as I passed. I think I’d prefer a trip to the clinic myself. WAG? Work Avoiding Bint! Well I couldn’t think of anything beginning with a G! Am I allowed to use the word Bint? Oh, there I used it again.